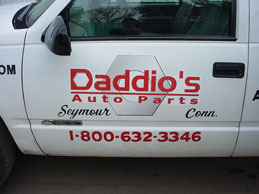 Daddio's Auto Parts opened its doors in 1928 at the same location where it is today. The reason we opened our doors back then is the same reason we open our doors today: to supply you with quality used auto parts at a fraction of the cost of new parts, and to give you service we know you will appreciate. Our sales staff has years of experience in used auto parts, and we stand behind the services and parts that we sell. We want to make sure that you are happy with the products that you purchase. We look forward to meeting you, and we look forward to the opportunity to serve your used auto parts needs.